Property Owners: List your property in Aquitaine on the premier site specialising in French holiday lets. More Info. View all gites and villas in Aquitaine. A gite holiday is the perfect way to go in Aquitaine, while an Aquitaine villa is another popular choice, but whether you choose a villa or a gite in Aquitaine, both are the ideal way to throw yourself into French life. For the duration of your stay, you can live like the natives and squeeze out every last drop of Frenchness to complete the perfect holiday break. France’s third biggest region offers plenty of opportunity to go swimming and enjoy the sea air on its long line of golden sandy beaches. With two hundred and fifty kilometres of coast, there’s a beach to suit everyone’s taste, together with sailing and some terrific surfing opportunities at Biarritz, Lacanau and Hossegor. For those who like to get down to the nitty-gritty of outdoor life, there are a number of designated naturist beaches, which are popular with both the French and international tourists. In fact, the Centre Hélio Marin, located in Montalivet in the Médoc, with its pine trees and wide-open spaces, is not only the oldest naturist centre in France, but the biggest in Europe. Inland, you’re positively spoilt for choice when it comes to sports and other activities. The Pyrenean mountain streams offer great white water rafting and canyoning, as well as hiking and fishing. Canoeing is available along many of the region’s waterways, while horse riding and cycling are also extremely popular. For the golfer, there are more than fifty golf courses to choose from, all offering different challenges over their many and varied landscapes. For something a little more tame, but just as enjoyable, try one of the aqua leisure parks. There are five in total, situated in Gironde, Périgord, Béarn and the Landes area, where there are two. Aquitaine is home to a great many UNESCO world heritage sites, among them the painted caves of the Vézère Valley, in the Dordogne. This prehistoric site contains twenty-five painted caves and one hundred and forty-seven deposits dating back to Palaeolithic times. Many of the paintings, such as the parietal paintings that can be seen in the Lascaux Cave in Montignac, are recognised as being prehistoric art masterpieces. 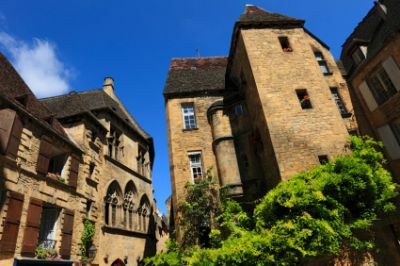 Aquitaine covers quite a considerable area, and while you’ll experience great food everywhere, there are many local variations and specialities within the region. In Bordeaux, don’t just imbibe the wines, but try the fresh oysters and a grilled entrecôte steak. Later on, treat yourself to cannelés bordelaise, mini-sized cakes that taste of vanilla and rum. Moving on to Périgord, despite being a relatively poor peasant region, the food is magnificent, serving up such delights as potted goose, truffle omelette, and farmhouse chicken and wild mushrooms. In Béarn, finish your meal with the local sheep’s cheese (fromage de brebis) and red cherries, while the further south you go, the greater the Basque and Spanish influences on the French cuisine. This has given rise to some gorgeous tastes in such offerings as spiced peppers (pimientos), the stews (marmitako) and the Basque tapas. Suffice it to say, wherever you eat, it’ll be a true culinary thrill.